Jack Gilinsky and girlfriend Madison Beer recently shocked fans with some x-rated PDA at the Fontainebleu Hotel in Miami Beach. 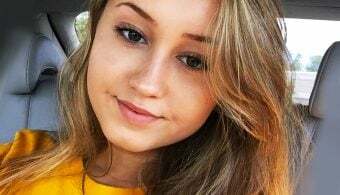 Fans spotted one photo where Madison appeared to have a bloody accident in her white bikini bottoms – and she responded! Scroll all the way down to see what Madison said about her stain! Madison and Jack made multiple headlines at the Daily Mail with their raunchy beach antics. Madison Beer strikes a casual pose in her pale bikinis. The pair appeared to have called the paparazzi for yet another one of their steamy beach “candid” shoots. Who needs Baywatch? Madison and Jack take a photographed stroll by the beach. They caught the attention of hundreds of commenters across multiple Daily Mail articles. True Love: Madison and Jack appeared inseparable. Daily Mail commenters were as charming as usual – with the majority of the top comments being rude. We love each other! Madison and Jack share a passionate kiss for the cameras. A top comment called Madison “gorgeous”. Another top comment (and hater) complained about “talentless internet-famous teens”. “I bet they called the paparazzi,” a hater from the United States wrote. “They are desperately looking for attention.” a Brit said. 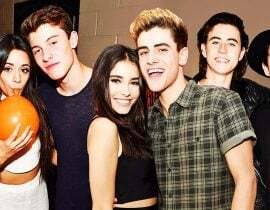 Jack Gilinsky stuffs his face full of Madison Beer’s behind. Jack was also spotted planting a big kiss on Madison’s… cheeks. Fans also spotted a series of photos that appeared to have some blood in them. In the photos, Jack was lifting up Madison and spinning her around in the air (below). It’s natural! Madison spilled about her bloody day on Instagram. 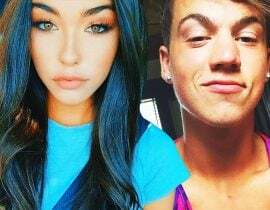 Although haters were trying to shame her, Madison Beer wasn’t taking the bait. “Sometimes, blood just goes through the tampons,” she wrote. “I have my period!” Madison said. “I am a human!” she concluded. Periods are natural!